Mulesaw: North Sea school box 6, completion and finish. 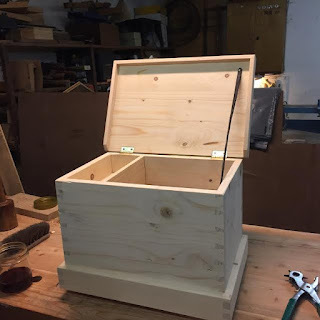 Contrary to my normal practise, I decided to complete the school box build before starting on something else. Projects that come home from the ship have a grave risk of ending up in the "on hold" projects line. Prime examples are the Gerstner inspired tool chest that hasn't been touched for about two years. It helped a lot that there wasn't much to do, in fact I just had to plane the lid a bit more, due to some more cupping of the panel, and then make a dust seal to go around it. Attach the lid and finish the box. In a rush of self confidence I made a small set of houndstooth dovetails for the dust seal. In the same rush of self confidence I thought that it was smart to saw of the rear part of the dust seal in a 45 degrees angle. I am still a bit unsure why I considered it a good idea at that time. Because it looks strange and a square cut would have been a little less work and have looked a whole lot better. The front of the dust seal was glued to the lid, and the side pieces attached with some lang headless brads. I home they are sturdy enough to help keep the lid in place. My idea is that they should sort of work as battens. I planed some chamfers and sanded the box outside and that, as they say, was that. The original book text describes how the lid is secured by means of some fabric tape/straps that will keep the lid from opening too far. I found an old piece of leather strap that could do this trick too. I made some holes and attached it with two nickel plated brass screws. Finishing is done with shellac. It is my first attempt of mixing my own, and I have tried to make a 2Lb cut mixture. I have two tones of shellac: Komet and Superior. At first I mixed two small batches of each to see if there was much difference in the colour. It didn't seem that way, so in the end I mixed them both together because I think that will give me enough to cover the box a coupe of times. North Sea school box with first coat of shellac. North Sea school box prior to coating. Nicely done! You beat me to it! At first I thought you wrote you had two tons of shellac. You actually wrote two tones. Haha. Thanks. Technically it wasn't a race, but I guess I sort of made it onto one. At least that helped me to find the motivation to complete it. I normally operate on a large scale with logs, but two tons of shellac is a bit above my range. Very nice project. 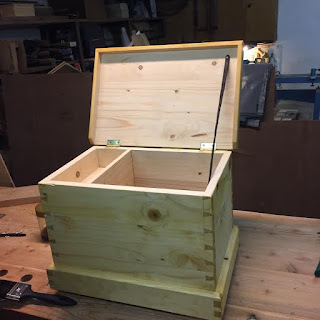 I think you should make a final posting with some "beauty shots" of the finished box with close details. I'll try to take some beauty shots once I have given some more coats of shellac. Looks nice. I'd like to see some detail shots too. Thanks. I'll try to get our son Gustav to take some pictures once I am satisfied with the finish. He is a better photographer than I am. Good job again Jonas, especially getting back to it right away. The 45 angles on the dust seal look good in these pics. Looking forward, like the others, to some professional quality shots by Gustav. Gustav is really pleased that someone would like to see his pictures. And I am happy that he likes to get involved in the project. So that is a win win situation.